Fluke Networks TS100 is a easy-to-use, competitively priced tester is three tools in one -- a fault locator, a cable & wire manager and a tone generator with SmartTone™ technology. From just ONE END of any two or more conductor cable you can measure up to 3,000 feet (915 meters). Easily find the distance to opens or shorts on electrical wire, telephone wire, security wire and coax. Results appear as a distance reading rather than a waveform, so it's perfect for technicians unfamiliar with Time Domain Reflectometery (TDR). Find and fix cable problems without pulling new wire or blindly cutting into walls. Intermittent faults are easier to find because the unit constantly measures while "On". 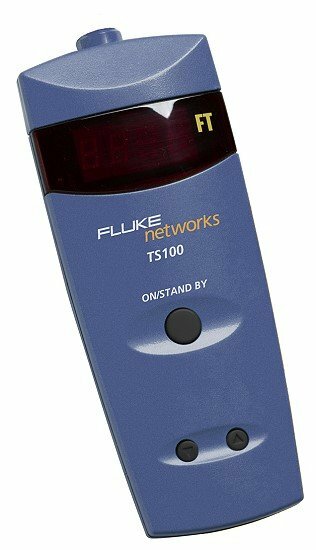 TS-100 is perfect for inventory management of cable stock in trucks and warehouses and it can help you generate more accurate bids for jobs by quickly assessing needs and managing the cable stock with greater accuracy. Patented SmartTone technology gives you 5 distinct tones to use for exact wire and pair identification, even in proximity to current-bearing cable. When touching the wires together and momentarily shorting the far end of a cable pair, the SmartTone technology will change the cadence of the tone generated. This tone change you hear through the probe positively verifies the correct wire pair. Voltage detection in the unit will immediately sound an alarm if you accidentally clip onto an energized pair, up to 250VAC.